New England Donor Services (NEDS) is a nonprofit organization based in Waltham, Massachusetts, that coordinates organ and tissue donation throughout New England and Bermuda. Through its two affiliated organ procurement organizations, LifeChoice Donor Services and New England Organ Bank and with its centralized tissue donation services operation, NEDS serves over 200 donor hospitals (including 14 are transplant centers) and thousands of donor families each year. As the nonprofit’s Director of Organ Operations & Surgical Recovery, Christopher Curran is responsible for overseeing the teams that handle organ allocation, the logistics of organ recovery, organ transportation and more. Time is a precious resource for Chris and his team and it can literally mean the difference between life and death for patients awaiting a transplant — so fast, safe, dependable transportation is vitally important. Additionally, as a nonprofit, it is important that NEDS maintain the public’s trust by using its funding wisely and controlling costs wherever possible. After a friend of NEDS President and CEO Alexandra K. Glazier recommended Essex Aviation’s aircraft advisory services, Chris reached out to Lee Rohde and Thomas Mitchell of Essex. Impressed by thier level of experience and excellent references, NEDS retained Essex’s services. Based on the results of the audit, NEDS made the decision to engage Essex’s consulting services. Essex worked with Chris and colleagues to complete a needs assessment — analyzing NEDS’ past use of aviation services to determine current and future needs — and then helped NEDS identify a unique aircraft leasing option that satisfied NEDS financial objectives. Chris also needed to find a candidate to manage the aircraft, so Essex used their extensive network of industry contacts to help him find the right aviation management company. When the organization’s three-year aircraft lease was approaching the end of its term, Chris went back to Essex to re-evaluate NEDS’ needs and options; NEDS decided to also explore the benefits that owning an aircraft can provide versus another lease. 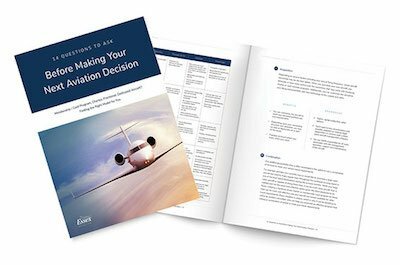 After additional analysis, during which NEDS weighed the pros and cons of lease vs. purchase, they decided that the purchase of a dedicated aircraft was the best option for NEDS to pursue to meet their future travel requirements. Essex negotiated the acquisition, handled the inspection and transfer of ownership as well as helped NEDS develop an aviation management plan. The relationship between NEDS and Essex continues to evolve: As the methods of how organs are allocated in the United States change, so, too, does NEDS’ aviation needs and requirements to meet the evolving needs of the patients and doctors NEDS supports. Organs now need to be transported across larger geographic regions, which means Chris’s staff and transplant surgeons are spending more time in the air flying to hospitals to retrieve organs. To address this growing need, Essex has often assisted Chris to find supplemental planes when the organization’s primary aircraft is unavailable.